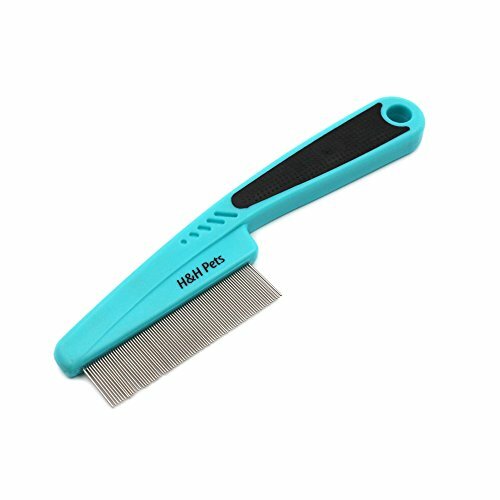 H&H Pets Flea Comb helps detect fleas and their eggs at early stages and effectively remove them. The flexible and wide pins on our comb also help effectively remove flea debris, mites, ticks, and dandruff flakes to keep your pet well groomed. We improved the product design and comfortableness by widening the teeth as well as replacing normal hard plastic handle with rubber-sheathed handle. This increases the comfortableness of holding the comb when combing your pet. H&H Pets Flea Comb is designed and tested in Los Angeles, California by pet owners to provide you the best product and experience. We care about your pet as much as you do and we want to make sure you and your pet are satisfied with our product. Our friends and family use H&H Pets product everyday and we always test our products to ensure our customer are 100% satisfied. We ensure the quality of each flea comb and present to you the best product. If for any reason you are not satisfied with your purchase, please message us. We accept return and full refund within 60 days. Purchase now, because we cannot wait to see a happy & healthy pet. We hope you and your furry buddy are happy using our product. If you have any questions regarding this dog treat pouch, please contact us at this link: We strive to make sure our customers are 100% happy with their purchase! We are proud to present you this flea comb. 15% of our profit will be donated to Hope for Paws, a non-profit animal rescue organization. Your purchase will make a difference for animals in suffering. We thank you for being our customer.